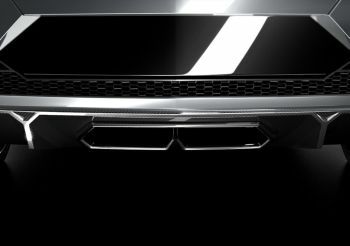 The teaser photograph shows a section of the rear of the new model, revealing a twin centrally-positioned exhaust exits surrounded by a carbon-fibre material splitter and a section of its honeycomb grille mesh. Lamborghini has released a close-up teaser image as it reveals that a new sports car model will be presented for its world première when the 78th Paris Mondial de l'Automobile opens to the media on 2nd October. The press release, issued in Sant'Agata earlier this afternoon, offers very little insight into the new model, and to tease everyone further it came with the brief tagline: "It’s not just a new Lamborghini. It’s a new world." The teaser photograph meanwhile shows a small section of the rear of the new model, revealing a large twin centrally-positioned exhaust exit arrangement fashioned in typical Lamborghini style which is surrounded by a typical carbon-fibre material splitter and a section of its traditional honeycomb pattern grille mesh. No detail of the model has been made available, leaving speculation to possibly point towards a new limited-edition 'Superleggera'/SV version of the V12-engined Murciélago LP640. Lamborghini's engineers have been working to push the Murciélago package even further and the firm had much success with the recent Gallardo Superleggera. This time last year Lamborghini showed the Reventón in Frankfurt, a low production run, jet fighter-inspired supercar that was developed around the Murciélago package. The sports car maker from Bologna, Italy, has traditionally used the major autumn motors shows held on alternative years in Paris and Frankfurt to unveil its new sports models, last year it presented the 20-unit, Murciélago LP640-based Reventón, so this year is set to be no different. This very eagerly-awaited new Lamborghini model will be officially announced on 1st October, before being unveiled to onlookers at the Raging Bull brand's during the opening press day in Paris on 2nd October.